Clearance ABSCO Premier Garden Shed for sale. Smooth Cream, Australian made and designed for maximum strength. This Absco Premier 3m x 3m x 2m colorbond Cream Shed must be cleared. Customer changed their mind about colour. Disclaimer: Product is a re-sell item, it comes as it and no refunds will be issued for change of mind. It is designed for maximum strength and manufactured from low maintenance ribbed steel sheeting. 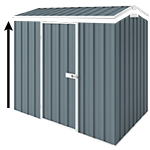 This 3m x 3m x 2m double door colorbond shed is very favoured as it suits most Aussie backyards and has a very attractive price tag.